The case for Wynonie Harris as the greatest 1940’s rock artist is a fairly simple one: You can start by saying that more than anyone he was responsible for the entire imagery of the rock frontman which exists to this day, a cocksure performer who commanded every stage he stepped onto. You can then bring up the fact that in the two full years of rock’s existence in this decade he scored seven Top Ten hits, two of which hit #1 including the top side of this very release we’re reviewing today. But his best case rests largely on the knowledge that he released the most monumental single of the idiom during this period, the record which firmly established the music as a commercial, and therefore cultural, force, the breakthrough #1 hit that announced to an unsuspecting world that this music was something to be reckoned with. Conversely the case against him as the premier rock artist of this era attempts to refute that by reminding you that the record in question was a cover version of the Roy Brown song which actually launched the entire rock era just a few months earlier and thus any originality points you were counting on to put Harris over the top of all other competition is stripped from his credentials and given to someone else. 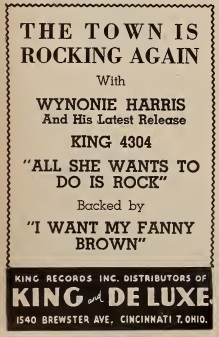 So if you want to promote Wynonie Harris as the top artist of the 1940’s rock scene it becomes a little difficult to justify when it was Brown, one of his greatest competitors for that title with eight hits of his own during the 1940’s – all of which he himself wrote – who also provided Harris with three of Wynonie’s seven hits… including today’s record. The cover record has a very negative image attached to it thanks to the unique circumstances which existed a few years down the road when the major labels which largely disdained rock ‘n’ roll found themselves confronted with diminishing interest in their usual brand of mild pop – at least in comparison to the types of unchallenged market supremacy they were used to – thanks to the rapid commercial rise of rock music in the mid-1950’s. Stuck with limited options at recapturing the upper hand in the music style wars the major labels did what they’d always done, target the uprising by covering those records and banking on their promotional dollars, name recognition of the artists and their mainstream radio access to squash the originals and eventually render those brash young upstarts irrelevant, thereby putting an end to their chances of taking over. Even taking the cultural implications out of it (which can’t be done when looking at it from a broader perspective which we’ll sidestep in this one instance) this method treated the rock movement like a fad, something akin to the mambo or folk music had recently been. The interest adults had for this kind of music, even when delivered by familiar white stars in tepid watered down versions, only lasted a short time before they grew weary of the nonsensical lyrics, repetitive rhythms and alien culture they represented. The stronger than anticipated commercial power of the younger rock fan who increasingly demanded the original versions – and the complicit radio outlets which catered to that once they saw the potential profit to be made by playing it – assured that the very concept of covering somebody else’s hit took on a negative social (as well as musical) stigma which soon all but ended the practice in all forms of popular music. But it wasn’t ALWAYS that way. In the 1940’s and early 50’s stars from all walks of music covered other records with alarming frequency and nobody seemed to care. That rock ‘n’ roll was usually not the target of these cover versions in the mainstream pop world wasn’t surprising since it was deemed non-essential music by those in their ivory towers, but there was no reason why other rock artists seeking suitable material wouldn’t look to latch onto a song that was drawing some attention for someone else. And so it happened… The Ravens covered The Orioles, their newest competitors in the vocal group realm of rock ‘n’ roll… The X-Rays covered The Ray-O-Vacs… The Five Scamps and Jimmy Preston covered Amos Milburn… Manhattan Paul Bascomb covered Wynonie Harris… and Harris along with seemingly everyone else (Clarence Samuels, The Robins) covered Roy Brown. All was fair in love, war and record making. So while that was still true enough in 1949, the marketplace for rock was shaping up to be a little different than pop music. The personal touch that artists brought to their original records seemed to be something this generation of listeners valued, probably because for years they’d been forced to accept their preferred artists cutting the exact same records as their white competitors. The authenticity issue that would eventually render the entire cover market obsolete was already making its presence known but had yet to fully take hold. To this point, other than The X-Rays besting The Ray-O-Vacs (by beating them off the line with their cover, leading many to think it was the original) and Harris’s early efforts at taking Brown’s songs, the recent trend has been the cover version never quite matches the original in terms of sales OR quality. Now the true test would come. Could Wynonie Harris outdo Roy Brown once again? There are two different question wrapped in one with that query. The first is more clear-cut, would Harris’s rendition of Brown’s Miss Fanny Brown be more commercially successful? His first two attempts at covering Roy Brown both had been. Harris’s cover of Good Rockin’ Tonight was of course the first #1 rock hit ever. Brown’s original was a strong regional hit in places when first released but it wasn’t until after Harris’s topped the charts that Brown’s was able to ride that interest to a national entry in Billboard for it. The flip side of Brown’s debut, Lolly Pop Mama, hadn’t charted back in late 1947 and wouldn’t in the future. Harris’s take on the song, released as “Rockin” was storming the charts, followed it into the Top Ten where it stayed for months. Now the interesting thing is this: Both of those songs were done at Roy Brown’s very first session where he was paired with backing musicians who were in over their heads when it came to understanding and being able to competently deliver the type of support the songs required. Harris had no such obstacles. He was a veteran recording star with a top notch band behind him on his December session that produced those cover hits. Once Brown got more comfortable in the studio, not to mention got his own band to help create the sound he’d heard in his head, then he started rolling creatively and commercially for the most part and his popularity was sky high and listeners simply could not get enough of him… so much so that his original version of Miss Fanny Brown made the charts for a lone week in April, 1949, a year and a half after it was cut and released. That just so happened to come just at the time Harris was going into the studio for his next session. Is it any wonder why he thought of taking a whack at this? Which leads to the second interpretation of that question about “Would he be able to outdo Brown?”, this time the one dealing with the more subjective view of if he could beat him aesthetically. Just so there’s no questioning it, Harris DID best Brown in that regard on the first two covers back in 1948, owing a little to having more confidence but more than that because he had better musical support. That should be the case here as well, as Harris is working with Joe Morris’s band again, but as we’ve seen the dream-team pairing hasn’t quite lived up to the billing yet. Their earlier cover of Drinkin’ Wine Spo-Dee-O-Dee failed to match the original by Stick McGhee and for some reason Morris, Johnny Griffin and company didn’t seem quite as effective when working behind him as they did when they were recording on their own. Their efforts this time out are still something of a mixed bag. The horns that open this are indeed more muscular than Brown’s had been, but then they give back much of what they just claimed for themselves by playing a muted circular riff featuring Morris’s trumpet out front. Luckily that’s nowhere near as prominent as Elmo Hope’s piano, which is the primary means for carrying the rhythm which suits Harris’s needs much better. The tenor sax solos on both records are well done but a young inexperienced Batman Rankins who was working with Roy can’t match Johnny Griffin when he puts his heart into it as he does here and so Harris’s maintains a much stronger feel, as Griffin squeals to the heavens to kick it off while the solo, short though it is, has a suitably raunchy tone. The one thing missing that would’ve helped his cause even more is the call and response refrain Brown utilized, but Harris steamrolls the lyrics at a faster pace which probably necessitated it being dropped. Ahh, yes, the singers themselves. We almost forgot about them, but then again how could you when you’re talking about perhaps the singer with the most impressive voice and delivery in rock in Roy Brown and the one with the most commanding presence in Wynonie Harris? These are the types of songs that Harris excels at. Give him a storming pace and a story that coveys a general mood rather than delivering specific plot points and he generally doesn’t look back. Hurtling headlong into I Want My Fanny Brown as Wynonie does we’d be at something of a loss if we didn’t know the particulars from Brown’s version, but it still wouldn’t matter much when Harris is at the controls. His bag of tricks are well-worn but effective as always: bearing down harder than is advisable for one’s larynx at various points, utilizing a cadence heavy delivery that sometimes is out of step with the syllables he’s given to work with but runs roughshod over any complaints by roping the band into aiding him with stop-time punctuations, though to be fair he does offer up an extended coda delivered in a comparatively hushed tone that works quite well and proves he didn’t always have to bludgeon a song to death to make it appealing. Generally speaking however he treats the song as an exercise in showmanship which was his forte in life. It may not always connect with the storyline but he comes close enough to pull it off and leave you wanting more. The record is Harris’s career in a microcosm. Never smooth but almost always making it work to his advantage… fumbling lyrics but picking the ball up and still running for an impressive gain in yardage… sometimes oblivious to the underlying features of his material yet making those same features all but irrelevant by sheer force of will, Wynonie Harris wasn’t the greatest artist of the 1940’s rock scene but he almost certainly was the defining one. The same can be said of I Want My Fanny Brown. While Roy Brown… yes, a more skilled artist with more influence spread over far more facets of his game… delivered the song he’d written with the proper mood and delivery for the lyrics, adding enormous emotional nuance that offered a window into his soul, we have to admit that while he may have performed the song itself better, or at least more appropriately for the content, in the end it was Harris – by never letting up and never holding back – who gave us the better record. 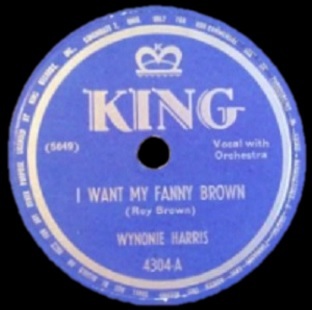 Leave a reply on "Wynonie Harris: “I Want My Fanny Brown”"